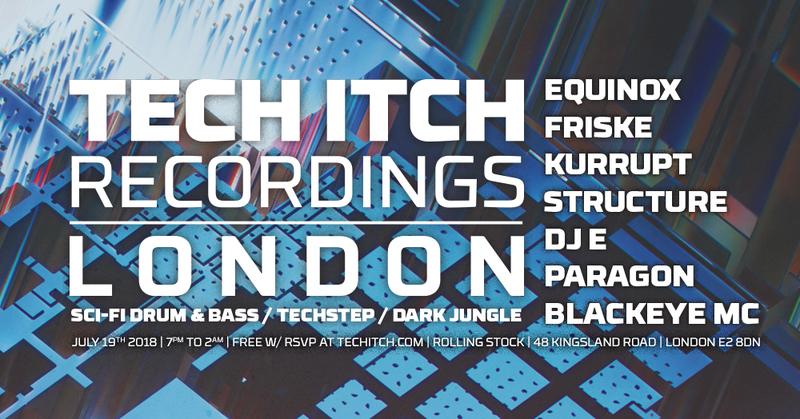 Join us on Thursday 19 July at Rolling Stock in Shoreditch for a night of twisted high speed breakbeats, abusive bass lines and dystopian atmospheres. Expect unorthodox sets of original productions presented by artists expressing their distinctive dark visions. The living legend that is Equinox headlines, supported by Metalheadz assassin Friske and Kurrupt of Suicide Audio. Expect fresh filth from residents Paragon and DJ E as we welcome our newest resident Structure to the crew. The venerable Blackeye MC will be presiding as usual. We begin at 7pm so come straight from work to catch the full spectrum of sci-fi drum & bass, dark jungle, and techstep experimentation. The kitchen is open early and we've got an industrial patio out back. Our new Funktion One soundsystem and iconic cinematic visuals by 3Dimensional Media will activate the collective sci-fi subconscious that is the essence of this music. If you use facebook please share the event page and click ‘Going’. If you use facebook please share the event page and click 'Going' - thanks!